Muruga comes to Tiruchendur "borne aloft on elephant, swiftly striding, irresistible as death, fleet as the risen wind"
Muruga with his six faces and twelve hands as Shanmukha graces Tiru-Ceer-Alaivai ('sacred place of the everlasting waves') or Tiruchendur. 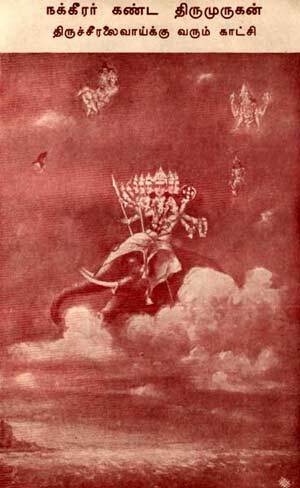 In his classic poem Tiru-murugarrupatai ('A Guide to Lord Muruga'), the great Tamil Sangam poet Nakkeerar describes the coming in of Muruga borne by Pinnimukam the celestial elephant and of the special attributes of his faces and arms. Verses 78-88. Muruga comes "borne aloft on elephant, swiftly striding, irresistible as death, fleet as the risen wind, on whose brow, scarred deep with sharp goad, unfading wreaths and medals toss, and bells of alternate peal ring on either side, beauteous gems of changing sheen flash like lightning on His crown, five shapes in one and wrought consummately; bright pendant ear-rings of varied work shine like stars clinging around the moon, shedder of light on far lands." Verses 89-102. In the minds of sages who with unfaltering devotion follow their own life, visions arise of His glorious faces: One face spreadeth afar rays of light, perfectly lighting the world's dense darkness; one face with gracious love seeking, granteth the prayers of His beloved devotees: one face watcheth over the sacrificial rites of the peaceful ones who fail not in the way of the scriptures; one face searcheth and pleasantly expoundeth hidden meanings, illumining every quarter like the moon; one face with wrath, mind filling, equality ceasing, wipeth away his foes and celebrateth the battle sacrifice; one dwelleth smiling with slender-waisted Vedda maid, pure-hearted Valli. Verses 103-126. Twice three faces thus each its part fulfill. On His shoulders erect, where rosy lines stretch from broad, beautiful medalled breast and where rest luminous weapons, glorious in His strength, having pierced the breasts of foes, one arm is raised to guard the sires that move in the heavenly sphere; one arm wields the elephant-goad, one arm rests on well-clad thigh; two arms whirl the lance and beauteous, broad shield, one arm on the breast shines; one with garlands is decked, one arm with armlet decked is waved aloft; one arm tolls with double peal sweet bell; one arm sheds plenteous rain from the dark blue clouds; one arm crowns celestial maids with wedding wreaths; thus twelve arms their due parts performing, diverse celestial drums sounding, strong horns blowing loud, drum and white conch like thunder resounding, peacock of varied plumes from His victorious banner calling, He speedeth across the heavens to all-praised, beauteous Alai-vai. "* Read Nakkeerar's complete Tirumurukarrupatai in Tamil or in English translation.